McDonald's offers their very first vegan Happy Meal over in Sweden along with the introduction of new McFalafel. The new falafel is made with chickpeas and seasoned with parsley, garlic, and cumin. An order comes served with two new dipping sauces: a creamy yogurt dip with herbs and a vegan sauce featuring the taste of grilled peppers. 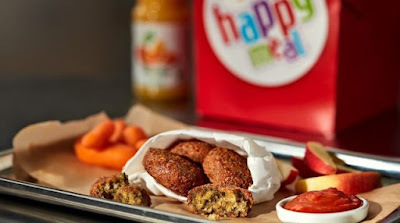 The vegan version of the Happy Meal includes a four-piece order of McFalafel, a choice of carrots, apples or small fries, an additional choice of carrots or fries, and a choice of either organic milk, orange juice, apple juice, or a small soda. The chain also introduced a vegan burger, the McVegan, in Sweden last year. The burger features a soy veggie patty, tomato, lettuce, onion, eggless McFeast sauce (mayo substitute), ketchup, pickles, and mustard on a sesame seed bun. Current Deals & Specials Updated for April. 2019 Brand Eating. Your Daily Fast Food Reading! Made in L.A. Since 2008.